In November 2008 I was promoted to a position in the company that would require me and my family to be sponsored to relocate from Portsmouth in the UK to Ridgefield in Connecticut, North America, just over an hour from New York. In this lens I detail the legal requirements; planning; the documentation, the conversations, the progress and dreadful lack of progress in our journey on this adventure to move to America from the UK. Maybe you are interested in the human story or maybe you are looking to do the same as us and want to be pre-warned of the trials and tribulations. However you came to be reading this, I hope you find it entertaining and interesting. Please review this lens at the top of the page and leave a comment at the bottom if you wish. Our lives before the offer of the new position were actually quite stable and going to plan. Yvonne, my wife, was in a good job as a solicitor in family law. Charlotte, our eldest daughter was halfway through a 2 year colledge course in Hospitality and Catering. Our youngest daughter, Kathryn was at an excellent school and doing well. So it wasn't the easiest of decisions to stop all this and up roots to America. An amazing opportunity but tearing people away from good positions all round. Well this is rather an important step but still very complicated and took far longer than it should have. Still, we do at least (and at last) have approval to go to the USA! We were very worried as the travel date was getting closer and the American lawyers still hadn't provided the necessary documents. We were applying for an L-1 visa for myself and L-2 visas for the family. Due to my being transferred within an American owned company we could apply for these as part of an 'L-Blanket' visa. The great thing about L-1 is that it provides for at least the spouse to work if required. An L-2 visa for my eldest daughter also provides for the chance to go to college which she desperately wants to do. Anyway, we needed to arrange an interview at the American Embassy in London and for this we needed a receipt number from the I-797 application for the L-Blanket. This we got in July and managed an interview on the 15th July. At the interview we needed the I-797 plus three copies of the I-129 that accompanied it. Plus passports, marriage certificate, birth certificates and sponsor letters from the company. Oh and we forgot the photos - a bit larger than standard passport photos. Thankfully there was a pharmacy near the embassy that had the good sense to provide photo facilities as well as other useful functions for visa applicants. After a 2-stage interview and lots of large payments - we were in! A great sigh of relief was heard across London. The company we used to transfer our pet dog. Billy was happy. Before we could move out the family needed to be introduced to America and especially the New York and south Connecticut region. I had visited many, many times but apart from one short visit by Yvonne, the family had no idea what to expect. So we had a great weeks holiday and scouting visit. 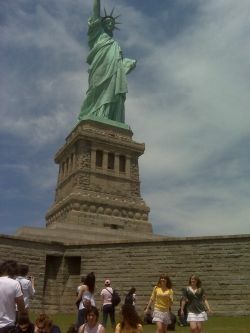 We started with two nights in New York itself.including an excellent day on Liberty Island. There was a long queue for the ferry but an excellent ride and the Statue was an amazing sight, the girls had great fun too. We drove up to Danbury CT via Norwalk as we wanted to check out the college. 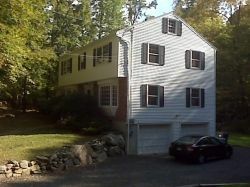 Although we checked out many regions we settled on Wilton and Ridgefield and hoped to find a house near here. 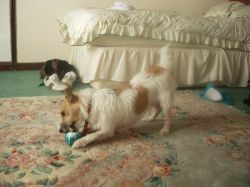 Billy is a Jack Russel cross with something like a collie, we reckon. A perfect pet indoors although a bit of an unsociable beast outside. Still, he is our responsibility and must come with us to America. It is greatly restricting our choice of houses to rent as well as stopping us staying in a hotel for the first few days. We have had to prepare him by having vaccinations and obtaining a pet passport. We have also contacted AirPets to arrange for him to go on the plane with us only in an AirKennel in the hold. Well you will be glad to hear he travelled over well and is enjoying the New England woodland and new smells. There was a 3 hour wait at the airport to get him out of customs but he was very good. He loves the walks around the lake and keeps us fit and gets us into the fresh air. OK so we were a bit naïve agreeing to Â£1300 ( $2000 ) budget to take out our furniture. Our first quote was Â£5000 ( $7500 ) ! So it was a decision on what was really necessary and whether it was actually cheaper to leave things behind and buy new in America. With a great deal of hard thought and shopping around we got down to Â£2300 and even Â£1600 if we didn't take the remaining wardrobe and bicycles. Unfortunately it will now arrive at least 4 weeks after us! UPDATE: Ho ho...4 weeks! We are now at 7 weeks and it is still not here! Hey its arrived! 9 weeks to get from UK to USA. Phew...finally sleeping in our beds again. Where does everybody else hold their 18th birthday party? The move to America coincides with the eldest daughters 18th birthday. Has anyone else had to arrange an 18th? Did you find anywhere that would do it? I can only imagine that everey hall and event facility has had a bad experience of 18th birthday parties as we scoured the whole of Portsmouth for weeks for somewhere to hold the party with no luck. We started with grand visions of weird and wonderful function rooms like the Spinaker Tower and boat hires - but were soon reduced to pleading for absolutely anywhere as we discovered that everyone was worried about being trashed or even worse, losing their licence due to under age drinkers. Finally, finally we found somewhere even if, however, it was a full week before the birthday so she would not be able to drink! We are very grateful to this hall which actually turned out to be reasonably priced and provide bouncers and a recommended Disco DJ (do they still call them that?). Hey! We Moved to America! Let me give everyone a very big piece of advice. Get your visa early and apply for the social security number at the same time! We had an inkling this was important but the American legal company took a very long time and we only got the visas a week before we left. When we went to the social security office we found that it would take 3 to 4 weeks to get a number. We are now trying to exist without a Social Security Number which is actually quite difficult unless you have lots of cash. "What do you need an SSN for? ", I hear you ask. Well basically anything which needs credit. "Don't get stuff on credit then", you might reply. Do you want to rent a house? Do you want an American driving license? Do you want a home phone? Do you want a mobile (cell-phone)? and...Do you want to get paid?! The immigration website says you don't need an SSN but we have found a different story. 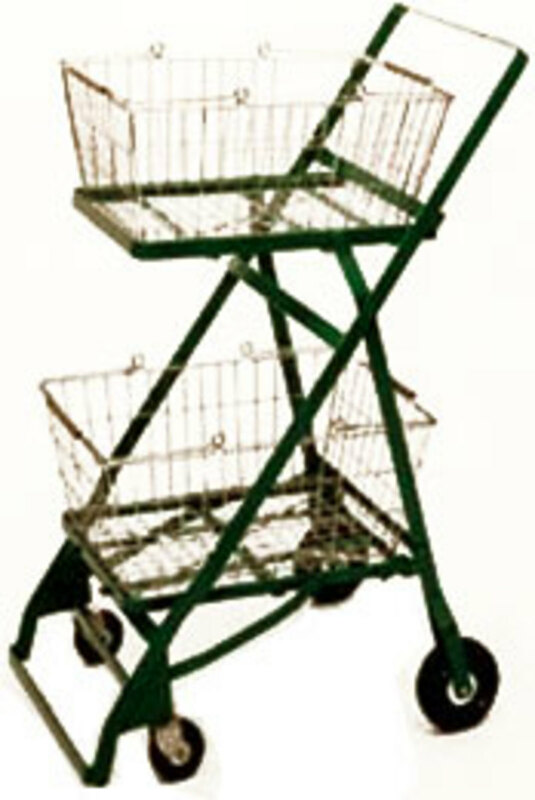 To take on any contract, especially one that involves providing 'free' equipment at the start, requires a credit check. To get a credit check you must have a social security number. To get PAID requires a social security number. We are having to exist on the small amount of cash we brought out and the good nature of the American people we are meeting. Even our credit cards are being stopped even though we rang them before we came out and told them what we were doing. OK, so how are we managing? Firstly my company have taken on the lease. Phew. They have made it so we actually had somewhere to live when we came out. Next, we are driving a hire car for a few weeks. Expensive but what choice do we have? Next, after a couple of weeks of strain, the landlord agreed to arrange the AT&T bundle of TV, Home Phone and Internet! It can be added to the rent so buys some time as well as gets the service. Keep ringing the credit card company to keep them going. Of course this is expensive using a sterling CC for dollar purchases. Well we gotta live. We then got into discussions with the company to give us an advance payment. Some cash to tide us over till we have the social security number and can actually get paid. Lets just hope we don't get ill! And that we don't run out of credit! We would go hungry. It's a fantastic place and a friendly nation. Life will be even better when we are recognised as people by the state! We arrived in New York on the 4th of August and its now the 4th of December - so its a kind of anniversary of our move to America from the UK. I can simply describe this first period as a roller coaster of highs and lows. As I am sure you can image the first few weeks have the feel of an extended holiday. It was hot and sunny and we were invited out by several people onto their boats. We are living by a lake that has a private beach and the girls went down there during the day. The 'holiday hotel' (our rental property) was somewhat lacking though. Because we didn't have a social security number we could not get TV, Phone or Internet. And the UK phone had little reception so we felt quite cut off. We also kept running out of water. Most properties are pretty self sufficient with cess-pit and their own well. It would take a deep well to supply enough water in the morning for our gang. We were finally able to lease a car. It wasn't possible until the SSN but even then the leasing company insisted we had a Connecticut Driving Licence. They argued with the Department of Motor Vehicles but finally agreed that I only needed a Connecticut ID. We now have a Subaru Legacy which is a very nice drive and all wheel drive for the coming winter. We opened a bank account at the local HSBC just a couple of days after arriving but it took 3 Months (!) to get fully up and running. They just kept asking us for more and more proof of identity and then we had confusion over the setup of internet banking. One thing we are amazed at is that Nowhere can you change money! The UK has immediate change facilities in every town and village and every hotel and travel agent. Absolutely nowhere in Connecticut. The bank could do it but they have to send the money away and it would take ages. Weird. And, of course, we had our first Thanksgiving. A friend suggested joining his family at the Plimoth Plantation - which is where the original English colonists arrived and built the first village. We had a great time at the traditional Harvest meal and going round the English and Native American villages. One thing that was important to us in our move to America was finding a good church we could call home. We were attending a great church in Hampshire in the UK. The family had some fun 'church crawling' around the local churches in Ridgefield, CT. The churches were all quite friendly - and most of them had excellent cake! But they were a little quiet for us. We had seen many of the big churches on TV and were hoping for a taste of the amazing quality of the worship and preaching we had seen. Anyway we eventually extended our scope and found a church in New Milford called 'Faith Church'. We all warmed immediately to the Pastor - Frank Santora - who is completely open, honest, professional and personal and gives excellent profound (and funny) sermons. We are extremely pleased with finding this church which has a regular Sunday attendance of about 1500 people in the various services through the day. He has recently written a book, 'Turn it around' , which is an inspiring book full of hope. Through this book he is appearing on TV and radio. You can hear his sermons on the church website. Well worth a listen. 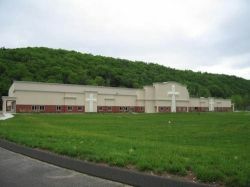 May 2011 - They have opened a new church much nearer to us at 'The Matrix' in Danbury. 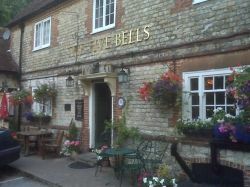 A friendly and welcoming place with a nice lunch afterwards! May 2012 - Gosh, they are now opening a new church right in the center of New York City. I don't know how many times I have started writing a book and not got past about 4 chapters - but my time in America inspired me to get on with it and complete it. America is a non-nonsense country overall and this does encourage a mentality of 'go on then'. Or perhaps it was Obama's call 'yes we can'. 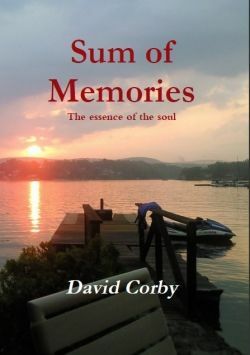 So here is my first book - investigating the essence of life. Many people dream of living forever by transferring into a younger body. But how do you think you and the people around you will react ? It is now also available as a download! So if you prefer to read on your laptop or have a Kindle type book reader then this is for you! I have already learned a lot from writing this and I know for sure now I can write more books. I will learn from each individual experience but I hope that each one will pass on a little (or a lot!) of the enjoyment I have in writing them. When we applied for our visas we were only offered the L1 Visa. All dependents received L2 visas. This was the quickest and easiest one to get considering it was a transfer from an UK arm of an American company. We were pleased that it included the 'automatic permission for my wife to work. However, and a lot of things have a 'however', it is nearly nine months into our stay in America and we are only now getting near to a date when we can hope for permission to work. And we are discovering it is almost impossible for our 18yr old daughter to get permission to work. For my wife she has had to fill out form I-765. With this, and a cheque for $340, she should get permission. Considering she has worked pretty well all of her adult life, and the fact that we could do with the money, this permission is eagerly awaited. For our daughter. The L2 visa did give her the right to go to college (phew) but if she wants to work then we have few options. They are basically the same as any other foreign national wanting to work here. Although I wouldn't normally expect special treatment for her, I think as she was dragged here and is still a dependent of mine then there ought to be a fast track way even if it was only temporary until she was 21 or the family went home. But no. She must be sponsored into temporary 'seasonal' work or apply for a greencard. That could all take forever. However - we now all have greencards! So no more concerns about work permits. Kat and Taylor at the top! We had a party at our house the evening before and then on the day went off to New York City for a meal and a trip up to the top of the Empire State Building. The gang that came to the house were typical teenagers and pretty hyper but actually well behaved. They actually made up party games out on the grass in the dark. 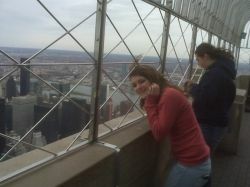 The Empire State Building is well worth a trip. The views are incredible. 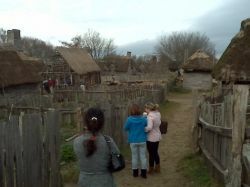 We were invited to spend Thanksgiving in Plimoth. 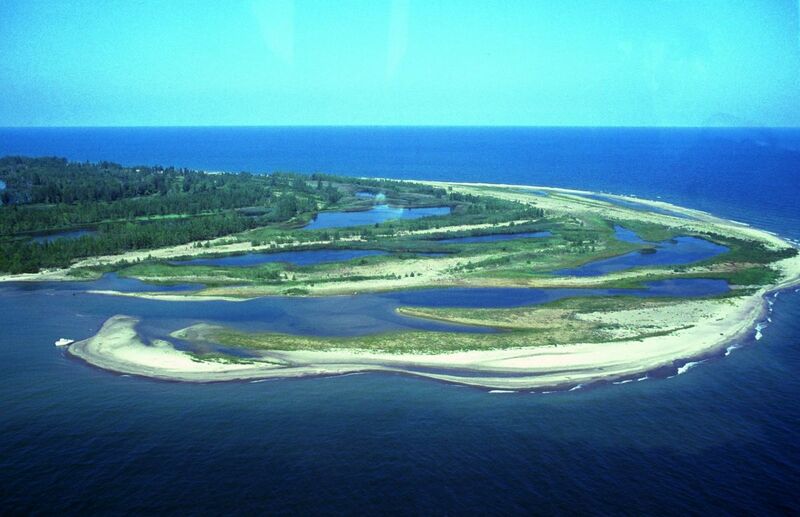 This is where the first colonists arrived and built the first 'English Village'. The site has an excellent centre with an authentic reconstruction of the original village inhabited by actors playing characters from the time. There is also a Native American village with real members of the local Indian Nation showing how they dressed and lived 400 years ago. The main fact I learned that shocked me was that the vast majority of the population were wiped out by our European diseases. We had a great time including a 400 year old traditional Harvest meal at the center and then a contemporary Thanksgiving dinner at a local hotel. A gold tree in our work car park! There is no doubt that the colours are much more vivid and even fluorescent in New England. Its hard to describe but there are more bright reds and golds than we have ever seen in the English countryside. and then you spend every weekend for the next 4 weeks raking up the blooming things! 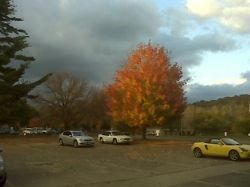 Update Oct 2011: Some amazing colors again this year but it did not last long here in Fairfield county. The tree pictured above lost its leaves before it was able to shine. The snow came pretty suddenly and we woke up to a beautiful foot thick layer of untouched covering. Amazing to look at ... but school was cancelled and I still had to get to work. No more raking of leaves but the morning and evening exercise is now shoveling snow! 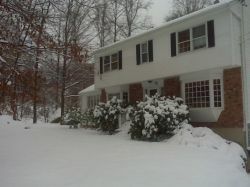 Update 2011: Lots more snow this year. Yesterday got down to minus 10 F (-25 C). Ultra freezing. 3rd April - all the snow has gone! Still a chill in the air but now very spring like. Gosh I found the winter a little depressing! Snow from December to March and everyone saying it was one of the worst winters they have seen in years. Got up to 73 degrees yesterday (18th March) but still a few piles of snow around. At least all the ice has gone and life is beginning to come back to normal. As with everything else since we arrived in America in August 2009, getting cars and driving has been extremely difficult. We started by having to keep a hire car for several weeks due to only being able to lease or buy a car if you have a Social Security Number. 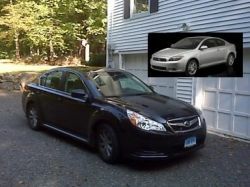 Then we had the stupid argument between the Leasing company (Subaru) and the Department of Motor Vehicles over whether I had to have a Connecticut driving license to lease a car. Subaru said you did and the DMV said you didn't. Finally it came down to me just needing a Connecticut Non-Driver ID to get the lease (paradoxically!). Getting insurance was painful too. No US driving license and no credit cards and no insurance history. So we ended up paying nearly $2000 for just six months!!! We were paying just $1000 for a whole year in the UK. Anyway at least we were finally able to have our own car and give back the hire car. Phew. This Subaru has been wonderful. I tell you, I was a bit anxious about the approaching winter. I had a bad experience the winter before when I visited on a business trip and had to be rescued by the company president and production director. However, we had several occasions during the winter when the fresh snow was several inches thick and the snowploughs were yet to get to it - and the Subaru Legacy just did not care. We had incredible grip whatever the conditions. Of course when we leased it we said - 15,000 miles per year. After just 7 months we were at 12,000 and we had only been on one small road trip. Just lots of little taxi runs to the school and college. So we were forced to get a second car. Thankfully for us (not for Toyota) there were some great deals around. We went to Toyota and drove off with a brand new car for nothing down and nothing for the first month! We drive it for a full month without paying a single dollar. Its a great little Scion TC. Very nice to drive although it is a womans car. (Dare I say!) I only say that because it is small inside and looks 'pretty'. It has 2.5 litres of quite powerful engine and gets driven gently at 25mph most of the time. But I am only average height and my head touches the ceiling unless I lean the seat back. Of course what we didn't plan for was Charlotte passing her test! Wahoo. However at 18 the insurance is even more ridiculous. We had quotes of $1000 per MONTH. We finally found one for $400 per month (ugghh) and so a total of $1400 per month just for the cars!! Makes me feel ill just thinking about it. What do Americans do at the weekends? We have been in America for nearly 10 months now and so have seen the local tribes at play at the weekends. As you may have read above, certain times of the year don't leave much time for play. Autumn (oops Fall) is time to rake up those leaves! Wintertime then clear away all that snow! Well not quite. When there is snow there is Skiing and Sledging. 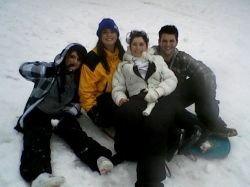 The family had a good go at getting freezing cold and thrown off sledges down slopes. I am far too sensible for that - but they seemed to enjoy it! The lakes froze over so there was some BBQs on the ice. And ice fishing. But there were stories of people falling through the ice (not in our lake I might add) - so another thing to leave to the locals. Its Spring at the moment and the temperatures are going up. 93F already which is near 90 degrees higher than it was in the winter. The weather is much more extreme her than in England - which makes it fun actually. I believe England benefits from the warm ocean currents - which basically means it rains a lot! Spring is time to get out the boats on the lakes. The bigger the lake then the bigger the boat. Don't get wet just yet though as the water is freezing! Football; Softball and basketball. Even Lacross which was a little surprising. And some soccer. Summer is lazy weekends on the water and in the water. Picnics; Jet skis and rubber rings. Summer is really play time. It gets incredibly hot and there are many more sunny days than England. England versus America in South Africa. 12th June 2010. A good game overall with America playing very well. England won and then lost the game. A great goal for England in the first 4 minutes and then a dreadful loose ball with the goalie catching the ball and then dropping it such that it ran over the line. One thing we have found as a family in our move to America is that life starts early here. In England we would set our alarms for 7 or 7:30 and then casually (on a good day) get the girls to school for 8:45 or so. I would probably have been in work by 8:30 if I wasn't dropping them off. Otherwise 9:00. Here its best to be at school by about 10 past 7 or so. And this fits in with most people starting work before 8 am. Conversely, however, the day does end earlier for schools at least. The school buses are usually starting their way home at around 2:20. For those that start at 7:30 or 8, many of them finish work at 4pm. That would give a nice long evening - especially in the summer. I kinda get the stretch at both ends though. Earlier start but still finish at the same time of 5:30 or 6. When we had a clear-out in the UK, and things were too good to throw away, the usual thing was either to give the items to charity or to attempt to sell the things at a 'car-boot' sale. (I suppose it would be a 'auto-trunk' sale here). The Charities would either have a 'Jumble-sale' at a church hall or sell the items in their shops. In America there is a tradition to use your front garden as a shop front. If there are just one or two items then they are put in a prominent position with a sign either with a price or just the word 'free'. But anything more than this then they lay all their unwanted items out in the open and put signs up around the local area declaring a 'Tag-sale'. What is amazing is the response to these signs. It seems there are hundreds of people just biting at the bit to get to look at your stuff. At a tag-sale held by a friend of ours there were masses of people looking and buying from as early as 8 in the morning. Mind you - with the massive basements and lofts in most of the houses - I do think its an American tradition to buy and hoard lots of amazing unused things. So the early bird gets a good worm. The man who discovered America - right? 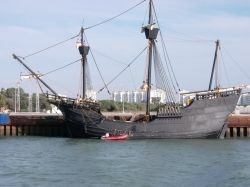 Most people think of Columbus sailing across the Atlantic and accidentally hitting America and opening up trade links. Perhaps the truth is weirder than the myth. Did you know that the Vikings and possibly Irish fishermen got there well before Columbus? Did you know he never set foot on North America? That he was a tyrant? That he is responsible for hundreds of years of slave trade? That he started the genocide of most of the native nations? So the first year rental payments are coming to an end, so what do we do? Do we pay rent for the next few years or do we try to make the most of our money and the opportunity for a bargain in this climate? 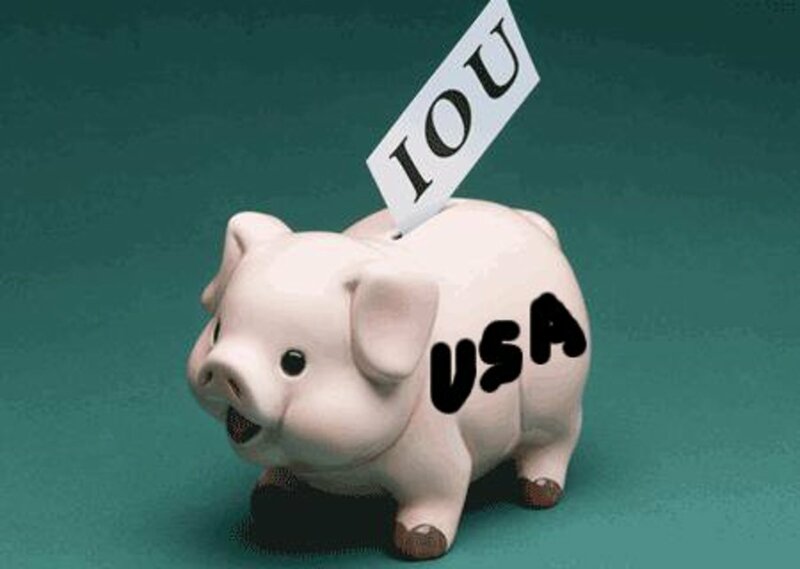 We have started investigating the possibility of a mortgage and are finding it very difficult due to not having any credit history in the USA. Our exemplary conduct in the UK is irrelevant it seems. The best deal so far requires a 20% deposit. Which at the moment is not possible. Hmmm. Renting is suddenly looking attractive again! What do we miss from England? It is hard to pin down what we miss from England but the picture is beginning to get clearer. Of course we miss our family and friends. We were not good at visiting when we were in England - but it was only an hour or two on the road when we wanted to. So looking at life in America there have been a few things that have come up regularly. The first is the kind of social life in England. England is much more like the European model of meeting people in town or at village centres in the evening. The services are much closer together than in the USA and so people walk more and bump into each other more. Americans are either in their house or their car. Everything here is spread out so walking is less of an option - so you have to plan every meeting. American towns tend to be pretty quiet in the evening. No masses of people just wandering for the sake of it. So walking down to services is another thing we miss. Just walk out of your house to the local store or one of the three pubs or Indian restaurants or Chinese or just to the little local Post Office. Most homes have something nearby. Yes the pubs. Where in America can you walk to a homely place just for a quiet drink? Play cards or a board game (without sport blasting into your ears). Sit in a beer garden and watch the kids play on the swings? A bar just isn't the same - there is always sport and food. Pubs sometimes do 'the big game' but often don't do food! Oh my goodness eh? Back to walking... when we visited England last I walked across fields and valleys on the South Downs. We have thousands of foot paths across land due to the 'right of way' laws. Just walk out for 10 miles and see beautiful countryside. Americans don't walk, generally, but it must be partly due to having to drive 100 miles to find somewhere you are allowed to walk. Unless you want to walk the roads which just is not the same. Community. Let me say clearly that we have been overwhelmed to find that Americans are very friendly and welcoming - but it is a country full of individuals. Maybe we need to live here for longer to find community but every meeting is specific and arranged and at the house, hmm its hard to describe the feeling. English towns and villages have a warmer feeling of people living together. American towns tend to be cold spread out places to drive to and then drive on past. Right, well the first hurdle is getting all the paperwork together. We are not very organised partly due to the fact we have moved so often. Everything gets put in boxes and we forget where they are. The next hurdle is the medical - just to make sure we don't have tuberculosis or syphilis. Those I don't mind really, but its the vaccination regime I am dreading. I consider it an assault to have to have all of these chemicals pumped into me. There is very little evidence that they actually work and lots of evidence that many of them do you harm. Dreadful. Oh well - perhaps I can get some guarantee that none of them contain mercury or thermisol at least. I would like to make it healthy to my old age. May 4th - Still bringing together the documentation. I admit we have been a bit lax at doing this but getting there. It seems our daughters can get work permits during the application which will excellent. The medical isn't bad at all. Just checking we haven't got dreadful diseases like tuberculosis and syphilis. Only had to had a tetanus jab so pleased about that. Girls having theirs today. All complete. This has taken far too long but its all our own fault taking time to gather the information and get our medicals done. The lawyers have all the information (10th June) so lets see how long it takes now. March 2012 - We have them! Initially we were issued what are called 'Combo Cards' which act as temporary green cards and employment authorization cards. But now we have the real thing! Spring break so we went off to Mystic village for a couple of days. We stayed in a nice hotel about 10 minutes away and drove in. We needed a pet friendly one with a pool and gym at a reasonable price. The village is very small but much like a little English port with the same quaint atmosphere, tourist shops and a vast selection of bars and restaurants. Well worth a visit especially to the aquarium. A great experience that would have been even better if it hadn't been pouring down with rain the whole time that day! Just back from our first real road trip. 2000 miles driving from Ridgefield, CT to Halifax, NS. It was much easier than we expected and actually quite enjoyable. Our first impression of Canada is one of a good mix of American and British cultures. This was not quite like a standard American road trip - where the idea is to see the sights along the way - but rather a visit to Halifax with a road trip to make it cheaper! We stopped at a Holiday Inn in Portsmouth New Hampshire (we had to, coming from Portsmouth, Hampshire UK!). This is a great little town with English style rows of shops and a buzzing night life. We greatly enjoyed the live music and parading through the busy evening streets. We went up the 95 and the border crossing was quick and painless. A few seconds of probing questions and we were through. The next stop was Moncton in New Brunswick. We stayed at the Crown Plaza in the centre of town. The main street had many restaurants but we struggled to find them open after 9pm and even more difficult to find Vegan food. Friendly but our brief visit was not so interesting. Halifax was at first a bit of a shock as we came out of the hotel looking for the waterfront and only found retail and industrial sites. We were starving and just went round and round trying to find somewhere nice to eat. We should have found somewhere online and used a map of course. Having asked someone where to go, we found the waterfront and were delighted to see local organized buskers and a small market. The warm weather and joyful mix of sights and sounds on the waters edge were a perfect mix after our days of travelling. Urban Halifax still had the detached new England style homes but these were randomly placed amongst brick houses and there were real flower gardens and even side-walks! The girls were disappointed in the shops which lacked variety and the malls which were small and quiet - but overall we liked the city and pleased to hear accents close to English and Scottish from very friendly and a more relaxed people. We stopped at Houlton, ME on the way back. A mostly deserted town with just a couple of diners to feed the border security. The Motel was clean and had everything we needed for the night so we were OK. Overall a good trip and we would do it again. The only reservation is that we saw enough trees on route to last a whole lifetime. maybe we would go coastal route next time. As another day goes by in Connecticut in the USA, we have again experienced the extremes of weather that we never saw in England. This time it was a tornado warning that didn't quite come true but most certainly gave us the entertainment of monsoon rain and a continual light show breaking through the intense and premature darkness. After storms that knocked out our power for weeks and heat that saps all your ability to work and play. Deep snow that lasts for 4 months and a chill that freezes every lake to a point of taking the weight of trucks. The English are known for discussing the weather - but at least here, it is never boring..
What happens if I go without my Greencard? So...having gone through all the trials and tribulations of moving to America and getting a Greencard, one of us went out of the country on holiday and left the Greencard at home. A hard lesson was learned as it is easy to travel out of the country and enjoy the holiday - but the problems start when you want to come home again. Basically you cannot go through passport control heading towards the USA without your Greencard. Even a British Passport is not enough. The first advice was to go to the American Consulate and that new papers could take 1 to 2 weeks! Imagine that when you have no money left and the possibility of many nights of hotel and food bills plus the cost of travelling back and forth to try and arrange the travel documents. It may be in a wonderful destination but that is no fun under all the stress and extra costs. The best advice is to have your Greencard Fedexed out to you. That is the only real way to get back home in reasonable time and with least fuss. Unfortunately some of the holiday places don't have good services even for the most prestigious company like Fedex. In our case it was promised for 6pm the next day but didn't arrive. Yet another night in a hotel. JetBlue were great arranging discounted hotel. When the Greencard did arrive there was then the problem of booking new flights - but thankfully JetBlue were very understanding and the flight change wasn't too expensive. Hi, thank you for documenting your journey. I have found this the most interesting and realist perspective of moving from the UK to US. I'm a British trained mental health nurse (degree not dip). I have been considering a move but the biggest hurdle I find is that the US doesn't recognise mental health nursing on its own so I would need to go back and study all branches of nursing. Something to consider more in the future. Congratulations on your move and all the very best for the future. Amazing Lens, I believe i learned something useful from your lens. Your writing method was superior and the way you presented stuffs was natural and makes me feel like you are my next door neighbor. Amazing lens buddy. Super Cool.!! American millionaires are now moving away from america, Income and corporate taxes are very high, I wonder why there are so many people who want to go to America. Fairfield is a very nice area to live (we have considered it but just too far from my work) and an easy trip to Norwalk. Just don't live too close to the sea! The latest storm destroyed properties right on the beach. A very witty and interesting insight into life on the East Coast! We are deliberating doing the same, as my husband may be offered a job in Norwalk. We have a young son and dog so many of your points touched upon our concerns. Do you mind me asking how old you are? We live in Brighton which is very vibrant and I walk everywhere to get around. We were thinking of choosing Fairfield to live. Any help would be much appreciated! Great stuff here, thanks for sharing. I still have to move, my visa has been approved. Good lens, it is so much work to change countries. Great lens! Do you also miss certain English types of dishes? I always hear from people that they miss certain dishes and specialties when tey moved. It is good to hear that people still are moving to the US. I have had a feeling for a while that people want to come to America a lot less than before since all these recession changes, United States losing its grip on the world and power, etc. great lens, really nice seeing the steps taken along the way. What an interesting Lens! Would LOVE to take a bite at living in the Big Apple! A fascinating story! As an American (somewhat seriously) contemplating a move to Europe, its eye-opening to read about the process in reverse! Glad you've been welcomed to the States! Nice Lens and good information. Thanks for sharing. Great Lens great reading, makes me wish I could turn the clock back, too late for me, being 63 but I hope it will encourage other younger people to take the plunge. 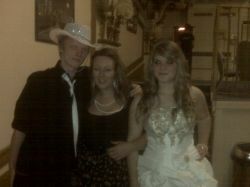 How AMAZING i have just recently got back from America where i visited my boyfriend who is attending college over there. I live in Portsmouth &amp; when i hit back here last night i was sooooo depressed to be back here. I would love to just uplift and go back to live there. But its not that easy is it ? Im only 20 and just recently finished college. I wish it was easy like going to Oz. Back to work tomorrow &amp; carrying on with my life in this wonderful place called England :( . Best of luck for your move. Fabulous news. I liked your post. want to know more about vacation places. waiting for your nest post. best of luck again..
Love this lens. So detailed and really informative. When i went to Florida to visit my Auntie i found the distance between places a chore to, especially as I couldn't drive in the US.Good luck with the greencard application! I move from Spain to the UK, now we were thinking the US could be cool... But getting a Visa sounds really complicated (even if as business owners we can actually create work, not compete for existing jobs). Thanks for your lens! I like your nice informative post.I think its easy only for American citizen not other country like India. Great lens, you've put a lot of time into this! Moving to another country has to be a difficult experience. Vacations are one thing - moving and adapting to another country's customs and culture - that's a whole other story. 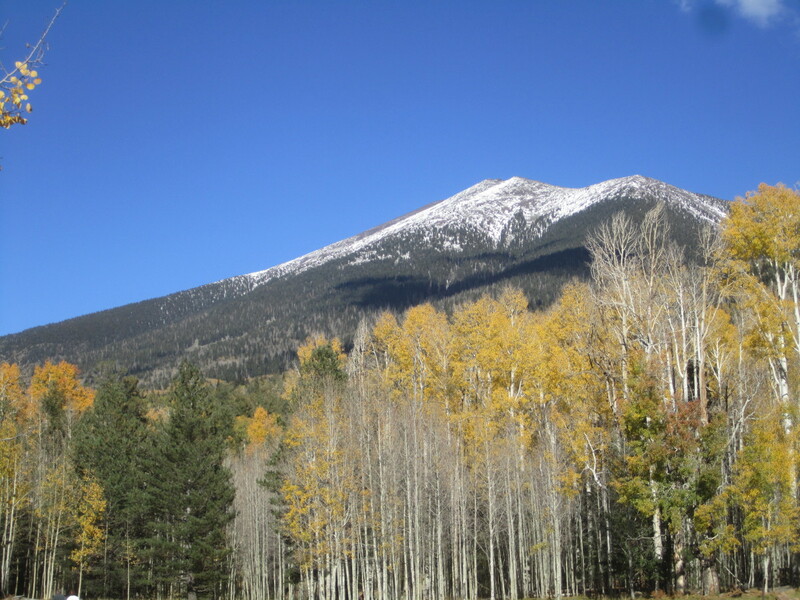 hey your lens it's awesome, I am new on SQUIDOO and first time visit your lens. it's awesome Well done. I think moving has always been and always be a painful task for us only the removalist and the furniture removal companies stand like a blessing. Only that you need to choose the right ones. Moving out is one of those things that has so many uncertainties that come with it. Especially if you are moving out on your own. Often enough people get an overwhelming sense of loneliness. You cannot help but feel homesick as well. I tell people to hire a moving company that is willing to help you move all of you heavy furniture, as well as help you move all of your things. Make sure they offer insurance for your belongings too. There is nothing worse than having to replace broken appliances or furniture just because of an accident. Sometimes that coffee machine just helps you get through those first few weeks. Well done on your move. Good luck. This was interesting reading as my Husband and I made the same trip (to CA) in Sept 2008. We also had L1 and L2 Visas which we got 5 days before leaving. However, there were major differences in our experiences. His company paid for the flights, lawyers, relocation costs (including shipping of our stuff and $10K cash to replace all our electricals), 1 month apartment rent, and 30 days rental car. We were already with the HSBC in the UK, so 6 months before we left the country, we set up new accounts and credit cards (with the same limits as the UK), so we had everything sorted and could start living as soon as we arrived. No pets either. The SS number and driving license were the only things we had to get upon arrival, but we had a relocation assistant provided to help us with the paperwork and also to help us find a place to live. Because it was all done as a corporate transfer to a well known company in the area, we did not have any trouble finding a place to rent, or get credit or anything. We had sold our house in the UK, so we paid for 2 new cars with cash, no credit needed for that. I hope that you have now settled down and are enjoying your US experience. I know I am! I appreciate your writing first... great lens. I guess I should tweet this now!.. mmm, done tweet! not only people from other world move to only US, but latest statistics (I saw in wiki) says that the immigrants are more to UK..... and Duncan Lewis, a big name for immigration solicitors in UK was also awarded for their immigration services. This lens is awesome. I love it. I am going to tell my editors on my Thai News website to write something about this lens and probably feature it. I will comment here again once we do. Congrats on your move to America. Are you liking it? Nice job journaling your experiences. Thanks for visiting my previous lens about emotional healing. For fun, hope you will visit my new lens about Travel and Dream Trips. Sincerely: Gary Eby, author and therapist.